Oceanfront Value Watch Sunsets, Whales & Turtles from Lanai! If you are looking for a relaxing tropical getaway right on the ocean’s edge, our condo fits the bill! Located in sunny Poipu, ours is the best situated suite in this intimate 12 unit complex (suite 303). On the top floor (one flight of stairs to entry) and jutting out from the adjoining suites, our comfortable 900 ft2 condo offers a stunning and unobstructed view of the ocean. Ceiling fans throughout and cool tradewinds keep the suite fresh and pleasant. Walk out to your private lanai (balcony) and enjoy breathtaking sunrise and sunsets, all the while listening to the waves crash on the shoreline below. From here you can also relax and watch sea turtles feeding below, pods of dolphins cruising by, and in season, marvel at the awe-inspiring show provided by humpback whales. 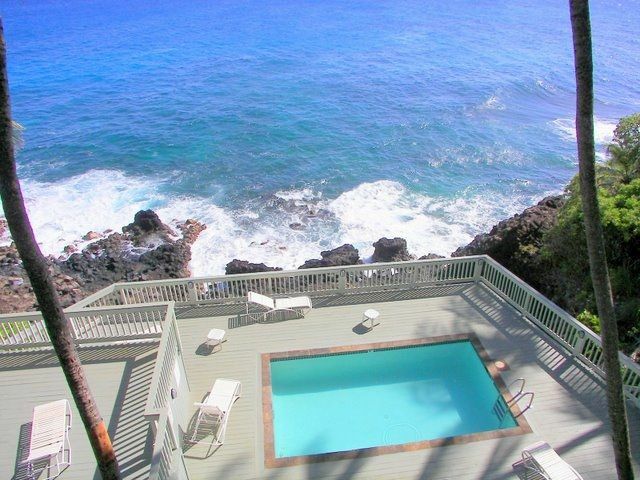 Lounge by the pool, or share a cool drink on Poipu Palms’ lovely deck overlooking the ocean. Enjoy the stunning 180 degree view of shorelines in both directions and the blue Pacific Ocean! Enjoy three amazing beaches within a short ½ mile walk: Brennecke (great snorkeling and body-surfing), Shipwreck (at the Hyatt Resort) and Poipu (rated in the world’s top ten). Wonderful Koloa town, world renowned Poipu Bay Golf course, and the best restaurants on Kauai are only minutes away. The garden isle of Kauai is also renowned for many activities available in some of the most spectacular natural settings anywhere. Hike or bike in Waimea Canyon, also known as the Grand Canyon of Hawaii. Rent a kayak and take a scenic trip down the Hule’ia, followed by a short hike to an enchanting waterfall. A hike on the Kalalau trail along the rugged Na Pali coast is a must. Snorkling, boogie boarding, scuba, zip-lining, ATV and tubing tours, and horseback riding are some of the many activities available on Kauai. We are a professional couple, an elementary school teacher and a forester, who love to travel and meet new people. We enjoy hiking, yoga, boating, and on Kauai love exploring the many beaches and beach activities such as snorkelling, boogie boarding. We also try and fit in some golf and tennis. While we have visited all of the Hawaiian islands, Kuaui holds a special place in our hearts. We love the lushness and wild beauty that Kuaui has to offer for outdoor pursuits, and the incredible weather that Poipu Beach affords. We fell in love with our condo in Poipu Palms because of its spectacular oceanfront location, the quiet and peaceful neighbourhood, and the fact that we can walk to 3 fantastic beaches within minutes. If we want shops and restaurants, quaint Old Koloa Town is just a short drive away. Our property is located in a charming complex that only has 12 units, which means that the pool is rarely crowded! We enjoy sitting on our lanai (which juts out from the others and is on the top floor, thus affording us lots of privacy) and watching turtles and whales go by under our very noses. The view from both our lanai and the pool is truly amazing. Each bedroom has its own full bathroom. Top quality Egyptian cotton linens. Boogie boards, beach toys, pool toys, tennis racquets/balls. On third floor but only one flight of stairs to entry. Very private large lanai. 2 twin beds in second bedroom can be combined to make a king bed. Sundeck and pool are right on the ocean! Boogie boards, tennis racquets, cooler, beach chairs and beach towels are provided. This is where we will stay every time we come back to Kauai! The shower is excellent, the view superb. Loved hearing the waves crashing against the shore. We are pleased you enjoyed our suite so much, and we'd love to have you back! Both bathrooms have been upgraded in the last year. Glad to hear you liked them! Megan and I are very pleased that you enjoyed our suite, the amenities and of course the lanai & view so much! All the same reasons we love it too! We would be happy to host you again next year. We had a fantastic time and this condo in Poipu Beach, Kauai. The condo was great, spotlessly clean and was stocked with eveything you need for a beach stay. The complex is only about 12 condos, so we felt like we had a private pool. It was great just sitting on the Lanai watiching the sea turtles and (occasionally) dolphins. It was also fun watching the waves pound against rocks. You can't swim in the ocean by the condo, but Poipu Beach park is about a 10 minute walk away for those who want to swim in the ocean. We just fell in love with Kauai and can't wait to come back to the condo!!!! We absolutely loved the view and location of this unit. The sea turtles were an added bonus that were so amazing to watch! Everything was seamless but we wished there were more reviews on how tired this unit was. While we don't go to Hawaii for the accommodations, we had hoped for something that wasn't so rundown. We are very pleased that you enjoyed the view and location of our suite but disappointed that you found the suite itself not to your expectations. This is the first negative review we've received in the ten years we've owned it. We have worked hard to keep the suite in good condition, recently re-modelling the main bathroom, replacing kitchen cabinet doors, new lanai furniture cushions and dining set among many other repairs & upgrades. Perhaps you haven't seen other reviews mentioning how tired it looks because you are the first to think this to be the case. Regardless, we along with our property manager will have a careful look at the suite to see what more can be done to freshen it up. We would also like to note that the second bedroom bathroom is being re-modelled in October. Great time at Poipu Palms! We had an excellent stay here with our 2.5 year old. The view from the balcony is just incredible. The apartment had everything that we needed and we were very comfortable. The place is a 3 minute drive to Poipu beach. I especially liked the grill in the backyard for everyone to use and the wonderful deck where we could sit and enjoy our meal. Would definitely stay here again. We are very pleased that you enjoyed our suite and the amenities at Poipu Palms so much and look forward to hosting you again sometime! We loved our stay in Poipu Palms #303! The top floor condo had a fantastic view over the ocean and pool. We saw lots of turtles, dolphins and whales daily. Condo was clean, spacious and very quiet. Loved falling asleep to crashing waves every night. Well stocked with all that we needed for the beach - towels, cooler, snorkel gear and boogie boards. Enjoyed the short walk to the nearby beaches - Shipwreck, Brenneckes and Poipu Beach. The condo was perfect - we will be back! We are so glad that you enjoyed your stay with us at Poipu Palms #303 and look forward to hosting you again! Being lulled to sleep by the ocean, watching swaying palms, and admiring marine life up close and personal is indeed a wonderful way to enjoy island time. When we are on island, we also struggle to leave our lanai, despite the enticing beaches and activities nearby! In lieu of damage protection insurance, a $1,500 damage deposit option is available.